My favorite boy toy is a fine art photographer and he does superb work. He started doing it during the days of film when each shot was expensive. He uses a tripod to ensure each shot is as perfect as he can get it with each and every click. I don’t. I’m of the hand hold and shoot it mindset. I don’t have the successes he has, but I also get shots that he doesn’t because of how long it takes him to do each shot. 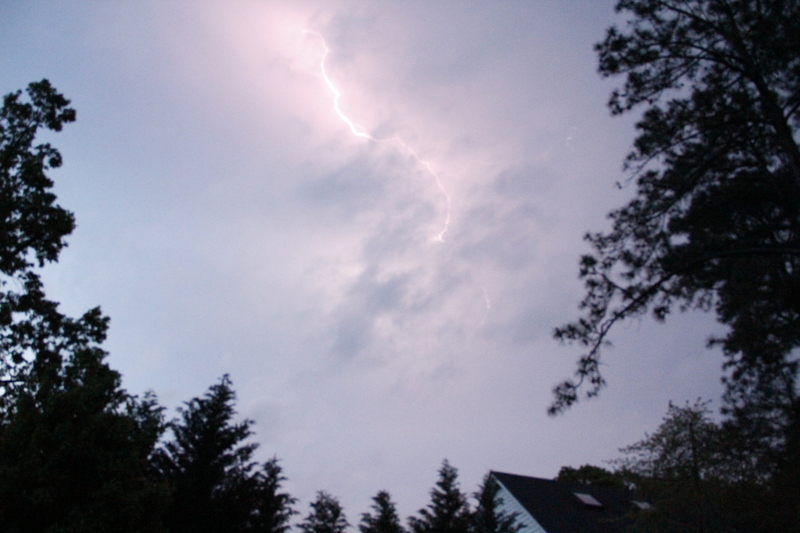 But the other night we sat on the deck and watched the lightning and I wanted to take pictures of it. He criticized me for not using a tripod and I was somewhat less than gracious about it (okay, we had a fight). He was right of course (honey, this is your apology). I would have been much better off if I’d put the camera on the doggone tripod and used the cable release he bought me. Word for tomorrow – TRAIL. If you prefer to work ahead, see the list for the week under “A Word A Day”. I still like your photo – the circle of the tree tops with the lighting in the center. But you are right that if your husband buys you nice accessories, like a cable release, then you need to humor him by using them (darn). He got a big laugh out of it and then proceeded to tell me again – what I did wrong. I did pay better attention the next day.